What is a Day in the Life of a Human Resources Manager Like? The job of a human resources manager can involve many tasks, but this position is always involved in some aspect of personnel administration. Those who work for large corporations likely are charged with one human resources specialization area, while an HR professional at a small institution will probably be responsible for every facet of staff oversight. An individual HR manager’s day will vary, as each may be tasked with various job duties such as talent recruuitment, compensation program management, personnel discipline, legal regulations compliance and benefits oversight, among others. 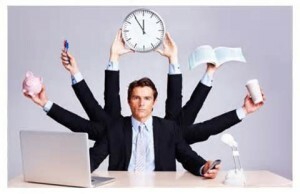 However, let’s take a look at what general activities may be sen in a day in the life of an HR manager. It’s quite possible that every day is different for a single HR manager. However, a very big part of every human resources professional’s job is communication. The manager may be facing onboarding or orienting new hires first thing upon starting the day. Training and staff development are often key job responsibilities. As an HR manager, you would have a protocol in place for conducting such orientation sessions that would probably involve going over company policies, giving a tour of relevant departments, filling out paperwork and making introductions. You may also conduct training for current employees of your organization. Training sessions could be on numerous topics such as new policies or procedures, specific job skills needing improvement or legal issues related to the company. Frequently, it is the job of the human resources manager to deal with issues facing an individual employee. You would need to sit down one on one and discuss such matters as unsatisfactory performance, disciplinary infractions and concerns about possible discrimination or harassment by another employee. It’s crucial that you are a good listener, able to take note of the most important details and that you can then take that information to come up with possible solutions. A manager of human resources carries a great deal of responsibility. Human resources managers frequently are responsible for making difficult decisions that have a great effect on the company, as well as on the lives of individual employees. You may be required to spend the afternoon in meetings to determine the fate of staff members’ positions within the organization. It’s not unusual for budget issues to require laying off or terminating an employee in order to save money, and one of your jobs may be to study the corporate structure and make recommendations regarding which positions are most and least important to productivity. One of your responsibilities is to be familiar with the positions and their job descriptions within the company, as well as to understand which employees are performing incredibly well and which are demonstrating difficulties. Speaking of employees, another duty you may take part in during your day involves interviewing prospective employees. You will have an understanding of the kinds of skills and qualities required in a particular position and be skilled in determining whether an applicant meets those requirements. At the end of the day, you may spend time entering important employee information or other data into reports. The collection and analysis of information regarding employees is important to the overall function of an organization. While these are merely an assortment of activities involved in the work life of an HR professional, you now have an idea of what may be expected of you in this role. A day in the life of a human resources manager can be hectic and full of responsibilities.